I was diagnosed at the age of 32 with leukemia on January 10th, 2006. Both my husband and I were shocked and our world seemed to be turned upside down. We were trying to start a family at that point and that is how the leukemia was detected in a simple blood test. Since I had virtually no immune system and was put on an oral chemotherapy, I had to stop working. This left me many hours in a day to obsess about this disease. Both my husband and I love dogs and had always wanted one. We thought we would get a dog after we had a child. Well, things change! In February of 2006, my immune system improved, and we were given the okay to get a dog. I saw Kimo’s picture online; a family who had him less than a week found out that the mom was allergic to dogs. My husband and I drove to San Jose to just “check him out” but what happened can only be described as love at first sight! Kimo was this adorable Golden Retriever, an eight-week-old puppy who was so loving and playful. He made me smile and laugh and actually forget about leukemia while we were at their home. Both my husband and I knew we did not want to leave without him–and we didn’t! Over the past two plus years, I have had many drugs fail me for my leukemia but Kimo was always there to cry into his sweet fur and cheer me up! 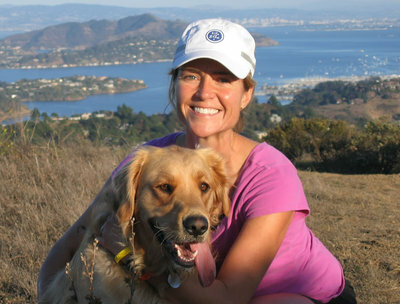 We have logged many miles in the Marin hillsides and beaches together. I recently had a bone marrow transplant up in Seattle and both my husband and Kimo came up there for the entire 4 months of treatment. Although Kimo’s puppyhood is filled with wild adventures, he seemed to know what we were dealing with in Seattle: going for the cure. Since my transplant, I have not been without him one night. He truly is my constant buddy as we take some slower hikes or just heal on the couch together!